Now available from September 2018 Dinner on From Laboratory Research to Startup Company - A Case History (Commercialization of the Rechargeable Manganese Dioxide - Zinc Alkaline Battery Chemistry). Speaker: • Dr. Alexander Couzis, Chief Technology Officer at Urban Electric Power. Also, Professor of Chemical Engineering at CCNY's (City College of New York) Grove School of Engineering. Presentation available from March 2018 Dinner on Refineries Refineries - Impact of Hurricanes Harvey & Maria, Flood Vulnerability and Mitigation Techniques, and Digital Technology Changes Coming Down the Pike. Speakers: Dr. Robert G. Bozic, Columbia University. • Don Glaser, President, & Matthew Garvey, Project Engineer, Simulation Solutions, Inc.
Now available: A note of interest to Young Professionals, as well as those who soon will be embarking on a Chem. Engineering Career. You and Your Chemical Engineering Career: The Next Steps is some advice and thoughts from Past local Section Chair Herbert W. Cooper. Next Dinner Meeting - Monday, November 19th for the Local Section’s next meeting for 2018-19 at the Pfizer Building (Dinner Meeting) Venue. Pay Now. Website Changes - We have added a News Notes and Blog Section. (Latest News is that our Chair Mary Lynch has become an AIChE Fellow. Details.) Also, the webpage for Other Events of Interest has returned, and coming soon an extended Job Search Link, as well as Internship page. Speaker: Ashok Shah is a former President of Alcatel-Lucent’s Global Professional Services organization. He spends his time serving as an advisor or as a member of the Board of Directors for a collection of public and private businesses and universities. He is the Founder and President of CEPS Consulting LLC (Warren, NJ). He is Co-author (with Ross Kelly) of the book, “Emergence of the ‘Me’ Enterprise.” Abstract below. Reservations: Please reserve now as this event normally sells out. Final Deadline to register: Thursday, 11/15 at 4 pm ET. Reserve Now. Student Registration. Fees and Deadlines: varies by professional category, and for the students. • Members of the Local Section $25. • Guests and Non-Members: $40 (includes local section membership for 2018-19). Note: PDH credits (when offered): an addit. $10. Please note that this event has traditionally sold out. Reserve now. Students: Undergraduates - free for all undergrads. Seating is limited, so please register early. Questions: Contact David Deutsch at info@aiche-metrony.org or call (917) 684-1659. About the Book - As new and disruptive technologies continue to transform the workplace, both employers and employees struggle to keep pace. The business practices of even five years ago are being revamped by new technologies, new applications, new devices, and new modes of connectivity and analytics, leaving many corporations out of touch, out of date and in some cases, out of business. As corporations scramble to keep pace, by way of downsizings, mergers, acquisitions, outsourcing, re-organizations and re-structuring, employees have been left to their own devices to find their niche in a new, increasingly competitive, digitized workplace. Am I at risk? - How much of your conversations with friends, colleagues and bosses involve talk of mergers, acquisitions, downsizings, re-organizations, outsourcing, or other types of corporate re-structuring? How much of your thought process is consumed by the possibilities that, despite your performance, your job could go away? Today's workforce faces unprecedented employment risks... not because of performance issues, or due to a sinking economy, but because of the rapid introduction of new technologies and new levels of competition. Am I prepared? - Do I have the skills to compete in an economy and work environment that is in a state of constant change? Would I be competitive in the open job market? I was clearly marketable three years ago; but what about today? Have things changed right before my eyes without me noticing it, leaving me ill prepared for what may come next with my company? Do I have the connections to help me make a change if that were necessary? What would happen if I lost my job tomorrow? 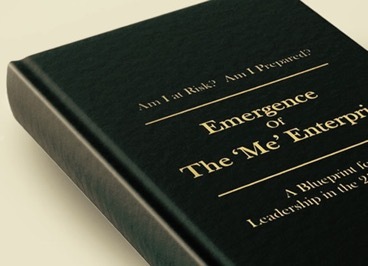 "The Emergence of the 'Me'"Me" Enterprise" provides a historical and analytical view of how digitization has disrupted the workplace, and outlines a set of practices and values, described as the '"Me Enterprise Blueprint,'", which serves as a recipe for surviving and thriving in this '"you are on your own'" environment. Speaker: Wendy Young is a Business Development Manager at Chemstations, Inc. She provides process simulation solutions through the CHEMCAD suite of products. Previous experience includes: seven years of process engineering experience in various chemical, pharmaceutical, and refining processes, plus seven years of technical service/sales in process, water, & wastewater treatment. If you are not a Member of this Section, you can apply the $15 additional amount paid as a Dinner Meeting Guest to a full Membership for 2018-19. Please notify Treasurer Andrew Sung that you wish to be a Member. Register Now.